Yesterday absolutely felt like fall in Minneapolis. Sunny with highs in the mid 60s - if that doesn't feel like fall, I'm not sure what does. The transition from summer into fall is always a favorite of mine. Trading in tank tops for oversize sweaters and sandals for boots - that's fall in my book. Since we're still in the 70s here in Minneapolis most days, it's all about layering. 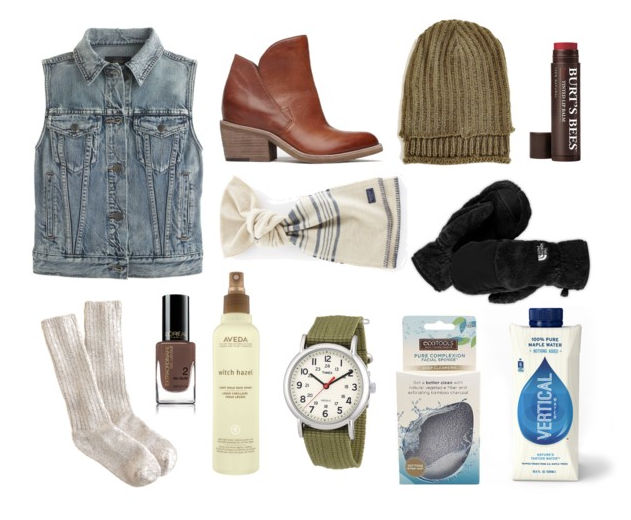 This fall, I'm looking for the perfect denim vest, a versatile pair of brown leather booties, a new beanie and scarf and some good, good wool socks. Paired with an olive Timex watch? That's the look I'm going for this fall. Fall means my beauty/health regime also needs to change. It's all about hydration. I drink a lot of water each day, but I've been mixing it up lately with Vertical Water. It's water that comes straight from maple trees and is naturally sweet (and so, so delicious). To hydrate my lips, I'm transitioning from lip gloss to lip balm, and I'm currently craving all of the tinted lip balms from Burt's Bees (so, so good). Because my face has been dry and tight, I recently began using the EcoTools Pure Complexion Facial Sponge. Mixed with my daily face wash, it makes my face feel so smooth and healthy. I'm also loving Aveda's Witch Hazel spray (smells so good), and L'Oreal's Extraordinaire Gel-Lacque (especially in that smoky brown color). Fall, you're nearly here. Welcome to the party.